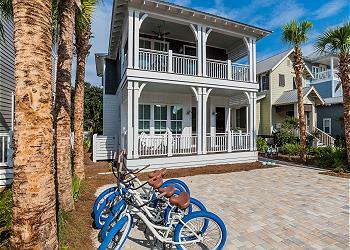 LOCATION: This home is located on the gulf. DETAILS: If you’re looking for direct access to the beach and gulf front living space, this is the property for you! The first of three spacious bedrooms includes a queen bed and a private bathroom with a tub/shower combo. The second guest bedroom is located down the hallway and equipped with a king bed and a private bathroom with a tub/shower combo. The third bedroom in this unit is conveniently located right off the kitchen and includes a queen bed, a private porch escape and an ensuite bathroom boasting a massive tub and stand up shower. The spectacular courtyard and Gulf views are the highlight of this home and offer an incredible backdrop to the open floor living area, kitchen and dining room. ** The Monterey Condominium will begin its roof replacement project the week of March 18th. They will begin on Building C and then move to B and then to A - one building at a time. Each building is projected to take 3-5 weeks to complete. They will be working between 8:00 am - 5:00 pm Monday - Friday with some Saturdays if needed. Once they reach building B and then A; the pool area will be closed until completion. We enjoyed our stay during Spring Break. Property and common areas were well maintained, secured and very quiet. The beach was beautiful and sunsets were incredible. We enjoyed the unit as it was perfect for our family. Wouldn’t change a thing. We will be back again. 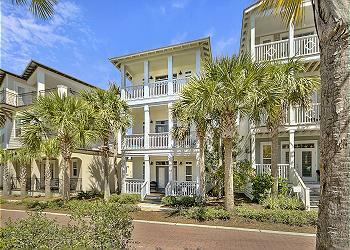 We are so glad that you all enjoyed your stay with us in Seacrest Beach at this amazing condo! The photo you shared is breathtaking! Thank you for staying with 360 Blue, we hope to see you again soon! We had a great experience at this property. It was very comfortable and well equipped. 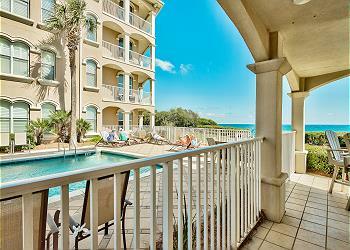 It was very convenient to get to the beach and pool and the view of the ocean from the porch was spectacular! We definitely want to come back! We are so delighted that you enjoyed your vacation with us in Seacrest Beach! We agree that this condo is in a prime location and is more than accommodating for all! Thank you for staying with 360 Blue, we hope to see you again soon! Reunions with old friends are the BEST! This condo was a great place for three couples - all recent "empty nesters" to enjoy time together. Highly recommend 723 Whiskey Bravo, Edwards, Big Bad Breakfast and Amici - all amazing restaraunts within a 10 minute drive. We enjoyed our morning coffee on the porch watching the dolphins, had easy access to walking/biking trail along 30A, the heated pool was perfect for the 72 degree weather, we watched the World Series on the big screen TV and played games at the large table. Newly remodeled - the furniture is comfortable and stylish. We will be back! We could not be more thrilled to hear how much you all enjoyed your reunion in Seacrest Beach! We agree that this condo is an excellent choice for a fun and relaxing getaway with friends and we are so thankful that you stayed with 360 Blue! We hope to host you all again very soon! Beautifully decorated and comfortable condo. Location was outstanding. The large screen tv was a hit for the men and the blankets were perfect for the women. If I had a negative it would be that the French doors in living room should have blinds to block the glare on the tv screen and for more privacy since it is on the bottom floor. But overall it was great and would definitely come again. We are so delighted that you enjoyed your stay with us in Seacrest Beach! We agree completely, this condo is hard to beat between the location and the amenities of the condo! We will be sure to share your valuable feedback with our entire team and we hope to see you again soon! My family and I had a wonderful time at this beach property. The furniture was well-kept and comfortable, the white sand beaches are beautiful and perfect for playing games, and the community has a ton of restaurants without being directly in the crowds. We enjoyed the easy access to the beach and how close the pool was - could sit on the porch and still keep an eye on the kids. Have been coming to this location for years and it always puts a smile on my face. We are so thrilled that you enjoyed your stay with us in Seacrest! We agree that these condos offer a peaceful and stress-free vacation for everyone and the community is great for exploring and without having to fight large crowds! We look forward to hosting you all again very soon!